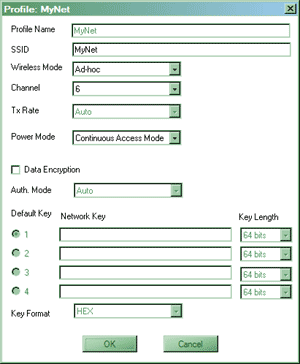 Last time we reviewed USB adapters for wireless networks of the 802.11b standard. Easy to connect and fast adapters are an excellent solution in many cases. Today we will test a different kind of equipment which can't do with USB anymore because of its high speed, but the compatibility with the 802.11b standard is preserved. 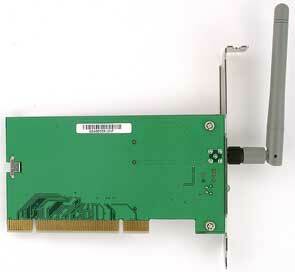 So, we will speak about the latest modification of this standard marked 802.11g. But first of all let's see who and why may need it. What's the use of the new standard? Wired networks that use special cabling ensure data rates of 100 and over Mbit/s. But it's not always possible or desirable to lay cables. That is why solutions that use cables laid out before (HomePNA use home telephone cabling, HomePlug use the electricity supply network) are of much interest today in spite of their high price (it's possible to save much more on cable laying) and a relatively low speed - 10 or 14 Mbit/s. Networks of the 802.11b standard look very attractive because no cabling is needed, but the data rate is only 11 Mbit/s. If the conditions are excellent and all the equipment comes from the same company one can turn on the turbo mode to get 22 Mbit/s, but since the channel is divided into two (for the duplex mode), the maximum speed in one direction reaches 1 MB/s at best and usually runs into 500-600 KB/s. This speed suffices in most cases but sometimes it doesn't. Cabling can ensure higher speeds, but as I already mentioned it's not always possible. At the moment the developers are working on the 802.11a standard which will provide 54 Mbit/s. But the solution isn't that simple as it may seem. The 802.11b standard works at 2.4 GHz, while the 802.11a at 5 GHz. This difference causes two problems - technological and juridical. In the first case it's clear that the standards are not compatible (802.11a isn't even compatible with 802.11). The 802.11a can be used as a radio bridge between two points but not for an office network or as a hot-spot because compatibility is urgent here, and since 802.11b is more popular, the gap will be widening as sales of Centrino based notebook PCs grow up. In office or home you can use equipment of the same standard but what if your colleague also needs the network access? There are universal solutions, i.e. access points and adapters which support both standards, but they are pretty expensive. Another problem is that not all channels of the 802.11a standard are permitted in different countries. The frequency of 2.4 GHz is free to use in most countries. 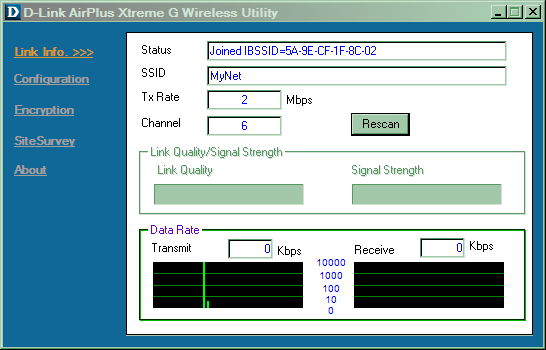 5 GHz is not. The situation may change, but it won't be quick and everywhere. That is why this factor tells upon the development of the 802.11a standard. So, the developers were faced with the problem to catch up with the 802.11a in speed preserving the frequency around 2.4 GHz and compatibility with the 802.11b. The problem was finally solved this year - the 802.11g standard is able to work with equipment designed for the 802.11b at any speed the latter supports and also works at the speed up to 54 Mbit/s in its own standard. First devices have already reached the market and probably need improvement. 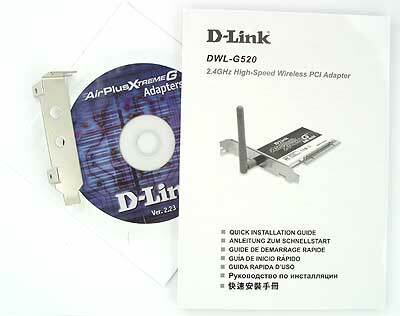 So, today we will carry out some tests using two adapters from D-Link and BLISS 500C notebook PC. 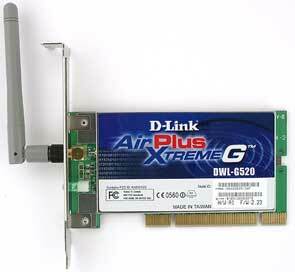 This adapter is a usual PCI card designed for desktop PCs. All the stuff is packed into a rectangular metallic box which also serves as a screen and which is glued to a piece of textolite :) An external antenna and PCI connectors let it communicate with the outside world. The antenna connector is standard and can be easily replaced. Also, you can see a LED outside. The adapter comes with a software CD, a user manual in 7 languages and an I/O shield which can replace a standard one if you want to install the card into a low-profile slot. This is a variant of the previous adapter designed for the PCMCIA bus instead of PCI, and it can be of much more interest for users of portable computers. The design looks less sophisticated without textolite. A removable antenna is replaced with a fixed compact one. But there are two LEDs. 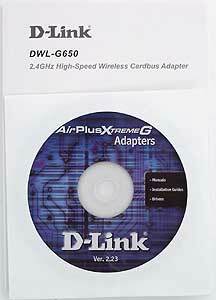 The adapter is supplied with an in-depth user manual and a software CD. The adapters have the same CD because a 32pin version of the PCMCIA bus is a special PCI modification and the contents of both adapters and the way they communicate are the same. By the way, some companies just offer a PCMCIA adapter coupled with a special adapter for "desktop" users. 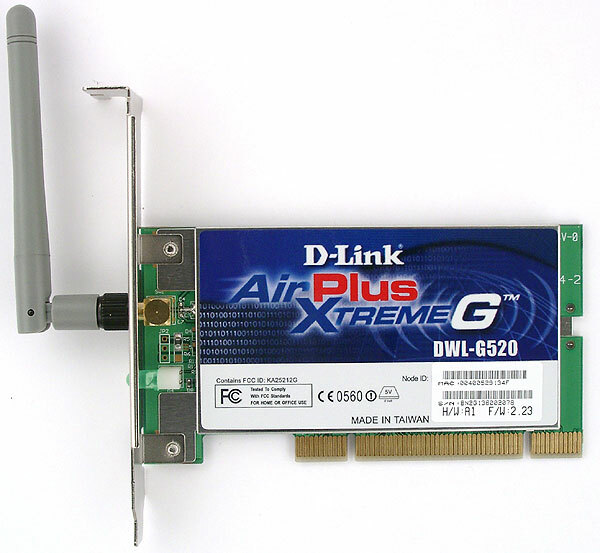 I'm glad D-Link didn't follow them because in that case we wouldn't be able to connect an external antenna which is realized in the DWL-G520 but is lacking in the DWL-G650. Remember that the wireless network support in the Windows XP that works perfectly for 802.11b fails for 802.11g. Operation starts just at 2 Mbit/s. That was exactly the problem in the Windows because we tried it in other conditions and brought the PCs close to each other. 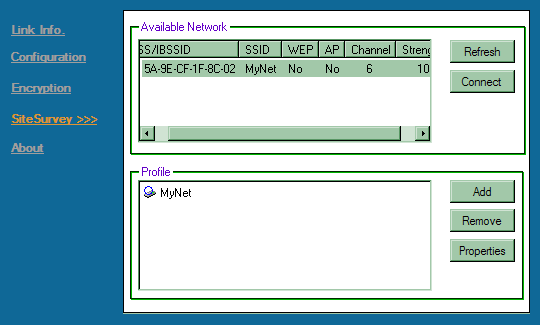 The problem disappeared only when the respective service in the Windows was turned off (on both network nodes). The management program interface differs a bit from the tiresome tabs, and it looks like the Web interface: hyperlinks and page opening in a frame. The first provides info on the current connection. I don't think it's needed to describe fields. The low connection speed on the screenshot is caused by the reason described above. Signal power and connection quality are not displayed in the software version I use (the situation was the same when I tested the USB adapter) - the place is reserved but the function itself is not realized yet. The next page lets you change adapter's parameters. 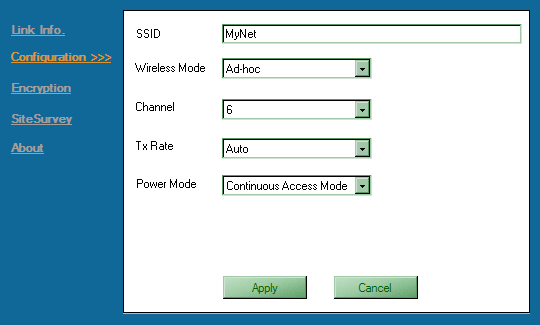 In particular, you can choose the functioning mode (point-to-point or infrastructure), channel, power saving mode. You can disable the automatic speed detection and fix it at a definite value as I did (though I'd better not). On the third page you can configure the data encryption mode or simply disable it. But you'd better do it if you are sure that nobody would tap your data. 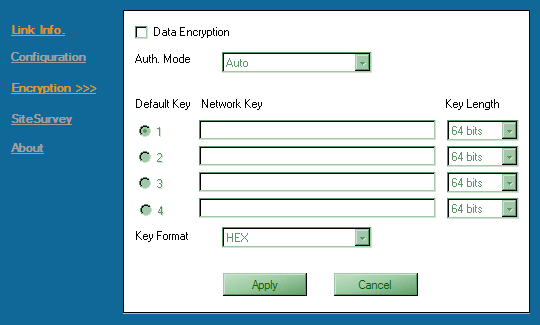 On the other hand, the WEP ensures pretty weak reliability (even in case of the 128bit key), and it's still better to use an external encryption mechanism. The next page is more useful for a mobile user. An owner of a desktop PC usually selects a network once and forever (at least, for a long time). A mobile user tends to change it. The profile configuration option can help him a lot. Here is a typical profile. It contains parameters which differ for different networks. 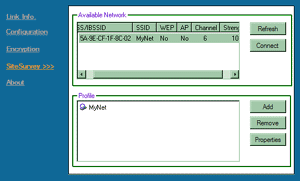 Thus, you can create a profile for every network to avoid changing parameters every time you change a network. This single factor makes D-Link's utility preferable as compared to the OS own means (even when they start working correctly). 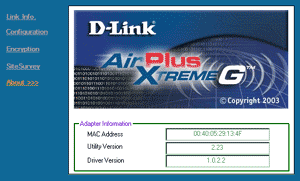 The last page just displays the MAC address, drivers and utility versions. The driver version is not 1.0 already, but the driver is not cardinally improved, that is why any problems can still be related with the software. The testing technique hasn't changed: Ad-hoc mode, the same hardware platforms (Athlon XP 2000+ based desktop PC and Intel Centrino based notebook), and the same AIDA32 for speed measurement. But today we have more than two pairs of tested devices, and I marked them with figures on the diagram. In the first three tests the notebook used the built-in LAN adapter (remember it's Centrino) of the 802.11b standard, and we changed only the adapters it worked with. The first two are D-Link DWL-120 and MSI UB11B USB adapters tested last time (exactly in this order), the third is DWL-G520. In the first part we tested its operability in the 802.11b mode and compared the results with other earlier tested models. So, the DWL-G520 is excellently compatible with equipment of the 802.11b standard (and it can be generalized to the DWL-G650). In this mode it works a little faster than both USB adapters. The advantage of the PCI adapters over the external counterparts takes place in some other tests, and the USB-Ethernet adapters also fall behind usual network cards (by the same 7-10%). This fact makes me think that one device is superfluous - the bridge between the buses makes the expenses greater. But the most interesting results are shown by the pair of devices of the 802.11g standard. The attempt to increase the speed cut down the throughput by 20% (though we were going to gain 50%). Look at the diagrams. If the forth one shows a line (though a bit stepwise one), the fifth one shows a real "cardiogram". Unable to cut the speed to an appropriate level, the adapters work at the maximum one and send data over and over again because of errors... The average CPU load in both cases makes 21%, and the highest one at 54 Mbit/s reached 60% against 30% in case of the automatic speed setting (i.e. the processor has to work hard as well). Once upon a time when hubs were not that intellectual, the connection of at least one 10 Mbit/s device automatically cut down the speed of the others to 10 Mbit/s. It didn't concern switches, but in usual cases the choice was either 10 or 100. For all devices. Later that problem was solved. We can expect a similar behavior in case of the 802.11b and 802.11g. But the question is: will their development follow the way of ordinary hubs or the way of switch hubs? So, there are two ways possible: if we connect to the 54Mbit/s LAN a device that works at 11 Mbit/s at best the speed on the whole network can drop to the minimal level, or all devices can work at their maximum speeds. I checked it for the Ad-hoc mode: the case with access points may seem simpler (you don't need to establish a point-to-point connection), but a lot here will depend on access points. So, I arranged a network using the DWL-G520 based desktop PC, DWL-G650 based notebook PC and DCF-660W based PDA (the latter adapter will be reviewed soon). The first three adapters support 802.11g, the latter works only on the 802.11b standard. In this case the speed is automatically selected. So, the notebook and desktop PCs worked at 36 Mbit/s. When we hooked up the PDA, no changes were noticed though the connection was established at 11 Mbit/s. I started the test using the desktop PC as a receiver and then also transferred data from it to the PDA. No speed-down was registered. When the desktop and notebook PCs exchanged their roles, the speed fell down a little because the channel was divided into two parts, but anyway, the speed remained much higher than the 802.11b could offer. So, at least in the Ad-hoc mode two high-speed devices remain fast in spite of low-speed devices hooked up. I don't know how a network may operate in the infrastructure mode, but I hope access points are smart enough to make it work not worse than in the Ad-hoc mode. I'm going to check it a bit later. Well, the 802.11g LANs do work. The developers solved the problem making the new standard compatible with 802.11b and ensuring higher connection speeds. A higher-speed network is more sensitive to the environment and it's not always possible to reach the maximum speed but... At least it will never be lower than the 802.11b can offer in the same conditions (as to the 802.11a, pickups and noise around 5 GHz may kill this network but won't tell upon 802.11b and 802.11g). What's the price? The new adapters are almost 1.5 times dearer though it's still lower than the "psychological barrier" of $100. The correlation is the same for the access points. I think that the higher speed is worth the money (if they are really needed). Just compare to 802.11a adapters which are 1.5 times dearer. However, the way the 802.11g enter the market doesn't look simple. Intel is not going to call its Centrino with 802.11b back. That is why I don't think high-speed hot spots will quickly become popular. But if you are going to lay out your own wireless network think what's better: to limit you network by 11 Mbit/s (22 Mbit/s at best) or to get a higher speed with the 802.11b compatibility preserved.